A few weeks ago friend and author Dan Pollock wrote me to say that he was cleaning out some old files and that he has uncovered something that might be of interest to me. Dan shares my love of the writing of John D MacDonald and has donated much of his own collection of JDM ephemera to The Trap of Solid Gold, including articles on writing, past issues of the JDM Bibliophile, and many other items of interest I had no idea existed. 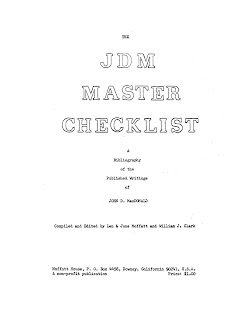 This time he had discovered a copy of The JDM Master Checklist and assumed I had a copy, but wanted to offer it in case I didn't. Well, I did not own a copy and asked him to send it along to me. If truth be told, I had never even seen the thing. 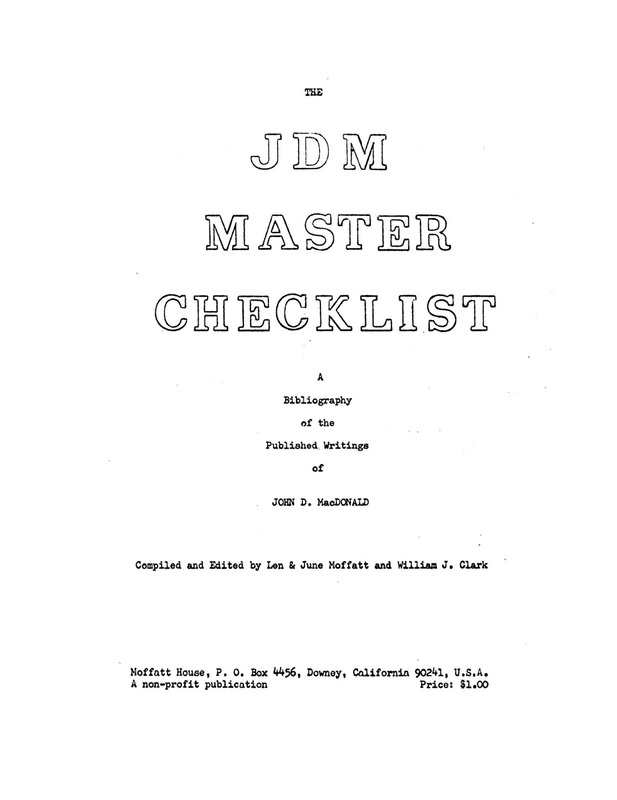 The JDM Master Checklist was a project begun back in early 1965 by Len and June Moffatt of Downey, California, to catalog all of MacDonald’s writings up to that point. In the pre-internet age where little if any indexing of pulp magazines existed, this was no small task, but as the JDM Bibliophile -- the fanzine the Moffatts created to begin this project -- began to circulate, fans, researchers and fellow bibliophiles started contributing information for what would become The JDM Master Checklist. MacDonald himself was contacted and became interested, as he was in the process of renewing the copyrights on these works, and he provided much valuable information from his vast files. Finally, in early 1969, the work was published: a 56-page mimeographed, stapled, stenciled work that contained everything known -- up to that point -- on the works of JDM. I never owned a copy of The JDM Master Checklist, for two reasons. First, it preceded my interest in John D MacDonald by about five years and was out of print by the time I became aware of it. Copies were hard to find back then as owners jealously guarded their own copies. Second, the list was superseded by Walter and Jean Shine’s John D MacDonald: Bibliography Biography, published in 1980 by the University of Florida. This I did obtain and it has been my primary source for keeping track of my own large JDM collection. There was to be a second edition of this work (something I myself worked on) but it never came to be. When I was finally able to look at The JDM Master Checklist a week ago, I was surprised at how inclusive it was. I had assumed that the Shines had done much of the heavy lifting in cataloging the nearly 400 short stories published in various magazines of the last century, but the listings in the Master Checklist is nearly as complete as that of the Shines. In addition to that there is a section of works published in anthologies, one on the novels (including international editions), an index, and even a biography. A Herculean task, to say the least, but the Moffatts had help: a lot of help, and they listed these people in their introductory pages. John D MacDonald fans own these people -- most of whom have probably passed on by now -- a huge debt of gratitude, and I have transcribed their names here as The Trap of Solid Gold could not exist without the work that they did. OUR APOLOGIES TO ANYONE WE MAY HAVE MISSED! Of greater interest to me was the biography that was included, running five pages and containing -- in addition to the standard stuff you can find anywhere -- much personal information on MacDonald, provided by the author himself, who is quoted frequently. I’m not sure any of this was really new to me, but I believe this is the only bio where one can find it all in one place, a rich collection of the minutiae of MacDonald’s interests when away from the typewriter. As such, I have transcribed it and present it below. At some point I’ll produce a stand-alone version with a link under The Trap of Solid Gold Resources over in the right column. If Dan Pollock does any future file cleaning I’ll be sure to share it here. Thanks Dan! John Dann MacDonald was born in Sharon, Pennsylvania on July 24, 1916. He lived in Pennsylvania -- with summer trips to a small, unworked farm on the Pymatuning River in Orangeville, Ohio -- until he was twelve, at which time his family moved to Utica, New York. After grade school, he attended the Utica Free Academy, graduated at 15, and took a post-graduate year there. He returned briefly to Pennsylvania at the age of 17 as a student at the University of Pennsylvania, but his formal education was to be completed in New York and in Massachusetts. He received a BS from the University of Syracuse in 1937, and an M.B.A. from the Harvard Graduate School of Business Administration in 1939. The effects of the Great Depression were still in force during his college years, and he "pieced out the pocket" at various jobs. In Massachusetts he worked in a factory feeding a bank of automatic wood lathes. In Syracuse he was a chauffeur, a fruit-stand clerk, a janitor in the medical arts building, and a book-duster in a bookstore. In New York City he sold magazine and book subscriptions office-to-office, washed dishes in a cafeteria, and was "an under-aged liquor waiter, overworked bus-boy and overworked food waiter". He also had a stint of collection work, repossessing automobiles, refrigerators and washing machines. During all of this time, he had no particular interest in writing as a hobby or as a career. He did write a little for his high school paper one year, but his writing in his college years was limited to the subjects he was studying. However, he has always been a compulsive reader, reading as many as three or four books per week. His childhood hobby interests, other than reading, included stamp collecting and model airplanes. Golf, skiing and archery were to follow. His father, a financial officer in the Standard Tank Car Company and Savage Arms Corporation, urged him to prepare for a career in the business world, and as John had no particular alternative to offer, he followed his father's wishes. From various sources we have learned that the literary world's gain was indeed the business world's loss. The brilliant writer could have been the brilliant business consultant. As a matter of fact, he became both an excellent writer and an outstanding businessman if only because of his business-like approach to the writing trade. During the time he was preparing for a business career, he had no interest in writing, but another major interest entered his life. He married Dorothy Mary Prentiss, an artist, in 1937. Dorothy received an M.F.A. from Syracuse University. She has taught at Cazenovia Seminary, and at the Clearwater Art Center. Her work has appeared in national shows, and is in several private collections. Their son, John Prentiss MacDonald, grew up to be an artist and a teacher, too. He and his wife, Anne, recently moved to Christchurch, New Zealand, with their three-year old son, Karsten, and one-year-old daughter, Margaret. John P. MacDonald teaches art at a girls' college in Christchurch. John D. MacDonald's career as a businessman was interrupted when he joined the Army in 1940. He served until 1946, mustering out as a Lieutenant Colonel. His career as a writer began during his overseas sojourn. The latter included China, India, Burma, Ceylon, Australia, New Zealand, Philippines, New Guinea, Okinawa, Ulithi, Hawaii and Saipan. Wartime censorship prevented him from writing long and detailed letters to Dorothy -- so he wrote a short story for her entertainment. The year was 1945. Dorothy submitted the story, and eventually it sold to Story magazine, where it was published in the July-August 1946 issue as "Interlude in India". Encouraged by this and subsequent sales, John continued to write. The short stories, novelets, articles and novels listed in this bibliography attest to how much -- and how well -- he has written in the past 23 years. John brought his knowledge and talent for conducting a business to the very serious business of writing-for-a-living. He applied the accepted and workable habits of a good business to his own chosen profession, such as regular office hours -- or as regular as one can make them in the writing profession. He knew -- instinctively, perhaps -- or perhaps it was just plain, hardnose common sense (or business sense, if you prefer) that one could not survive as a writer if one did not produce. Sitting around half the day waiting for "inspiration" to strike was fine for the dilettante writer, but not for the working writer. The more words going the rounds of the publishers, the more chance of selling some of them. His first sales were to the pulps (although Story magazine, where his first story appeared, was not in the pulp class), a magazine market that had been somewhat depleted by the paper shortage in World War II, and which eventually breathed its last in the early fifties. Television and the paperback market provided -- and still provide -- the same kind of entertainment that once could be found only in the pulp magazines. Today's “Man From UNCLE” was yesterday's "Doc Savage". But the pulps were only a training ground for MacDonald. He was a hack only in the sense of being capable of turning out thousands of words within short periods of time. This is not to say that his early stories were all gems of literary craftsmanship. He was learning the trade, and competing with writers who at that time were "old-timers" in the field. Many of the top-name writers of that era had started when they were very young men. Some of them went on to become top names outside of the pulps, and others never graduated from the pulp methods of story-telling. As someone once said, "MacDonald seems to know something about everything and every place". This remark was of course inspired by the variety of subjects and places to be found in JDM stories. It is obvious that John has a fantastic memory, and is capable of transmitting the pictures in his mind to word-pictures on the printed page. As a result, he did not become just another hack for the pulps. The slick magazines and the hardcover and paperback markets were goals he achieved because no market could be more demanding on him as a writer than he was on himself. As a matter of fact, during his first full year of writing for a living (1946) he sold one short story each to Esquire, Liberty and Cosmopolitan, and in 1947 he sold ten or twelve stories to the slicks. He was not so much writing for the pulps as he was writing stories and then trying to sell them wherever he could. Had Collier’s rejected his first serial, it probably would have sold to Popular Publications. He is "more intent on telling it true than in selling it once it is told". With this motto, he became more than just another writer of suspense fiction; he became a great American novelist and short-story writer. In later years, when he was established and successful, he had his son, then about ten years old, help him burn approximately two million words of "impossible" manuscripts. Imagine the courage, the integrity and the self-criticism it took to do that! He was one of the first -- if not the first -- paperback writer to be elected to the Presidency of the Mystery Writers of America. Writers of paperback originals (not to be confused with paperback reprints of hardcovers) have only recently come into their own -- that is, to be given the same "prestige" that was once reserved for writers of hardcover books. By concentrating on the paperback market, and not being concerned about the prestige associated with hardcover publication, MacDonald helped to raise the quality of the market, along with others who did not worry about the comments of hardcover-oriented critics. Over the years be has won awards and acclaim, with many reprintings of his work, including translation into several foreign languages. He has been dubbed "the writing machine" by his friends, and is generally known as a "writer's writer". The latter translates into: "Geez, I wish I could write like that!" Although he is generally known as a leading paperback writer, he has had twelve hardcover books published, not counting Three for McGee, which is a hardcover reprint of three paperback originals. Five of the twelve had been published at the time he became President of the MWA in 1962. We once asked John to list his favorite writers. He refused to attempt a list of living writers, because an omission could sound like a knock, but he did list deceased writers who are among his favorites: "Faulkner, Chandler, Hemingway, Camus, Conrad, Maugham, Cary, London, and (so help us ) Kipling and Fitzgerald." If you have read The House Guests, you know of the MacDonalds' love of animals. They still have old Knees, the goose, and her child Duck, a Peking from an egg she hatched. They also have two cats, each one-quarter Abyssinian, three years old, from the same litter: Beauregarde and Marilyn. Each has only one good eye, due to rhinotracheitis in the first week after birth. John says that both cats are "frighteningly bright", and -- if you have read The House Guests --we say that's as it should be. John says that he exercises by walking, and that he is in pretty fair shape at six feet, one and one-half inches, and 173 pounds. We would consider fishing as exercise, but to him it is an avocation. He gave up golf because it took too big a piece out of the day. On their annual visits to their home in the Adirondacks, John engages in his "traditional" exercise of felling, hand-sawing, splitting and stacking all of the cords of hardwood that they use. His interest in (and knowledge of) boats is well known, and he is rather proud of his "very fast and satisfying 240 horse Muñequita", and his little sailing catamaran. He was once a semi-pro bridge player for large money and a "pretty fair country chess player," but these too would steal the hours he needs for his other major interests. He is wary of competitive games because he can get hooked on them, and they would take time that he prefers to spend in other ways. He does love poker, and considers himself a purist in that he prefers table stakes, pot limit, 3-card draw or 5-card stud, nothing wild. "I play to end the evening ahead, and have no wild, wistful optimistic urge to try to improve a nothing hand." His favorite spectator sports are pro football, the bullfights and professional hockey, in that order. He is a long-time "wistful" supporter of the Cleveland Browns, dating from the first year they had Jimmy Brown. But he would rather be slowly parboiled than to have to sit through a basketball game. He is not a joiner. He belongs to the MWA, the Authors Guild and the P.E.N. Club (Poets-Essayists-Novelists). He resigned from the Players Club because he didn't use it. About music, he says: "I just went down and checked the records most recently played, and find a most catholic assortment: Billie Holiday, La Misa en Mexico, Simon and Garfunkel, Pablo Casals, Modern Jazz Quartet, Brubeck, Chicago-The Blues Today, Ohana-Concerto for Guitar and Orchestra, Eydie Gorme and Trio Los Panchos, Illya Darling, Tatum and Bach. "I guess I like all music that has enough quality of invention, guile and surprise so that I get a feeling of pleasurable amusement when they fit the pieces together in a way I could not have anticipated. I have good stereo equipment, and built a lot of the pieces of it myself. Most 33 1/3's have some dreary bands thereon, so I tape to eliminate the drearies, and because I scrupulously clean tape heads and demagnetize, the per-play loss of quality on the tape collection is infinitesimal compared with the loss resultant from needle play, even on the Marantz turntable." His favorite hobby is photography, and he has achieved a semi-pro status in that field. He is a member or the ASMP, and has sold color work to Venture and True. He has also done back-of-book studies of many writer friends. He uses Nikon and Rollei equipment, and prefers to work in black-and-white. He doesn't have the time to do his own lab work, and uses a professional lab in New York. He says that photography is good for the novelist's eye, "Keeps it fresh and questing." We asked him if there really was a Plymouth Gin (a favorite or McGee's), not having been able to find any in this area, and also asked him about his other favorite drinks and foods. His reply: "Yes, Virginia, there is really a Plymouth Gin, and very good and dry and strong it is. I like it in a beaker of cracked ice, with a dab of extra dry sherry. Despise all sweet drinks. Like very spicy Mary's, like outdoor drink or Planters Punch, no sugar. Great Western Brut is damned fine champagne. Like dark beers. There is no domestic beer worth drinking. Have cast-iron stomach, and most enjoy the very spiced Spanish, Mexican, Italian dishes. Love Julia Child but hate French cooking. Indifferent to steak. Would prefer knockwurst and kraut any time." John said recently that he is not "a political animal," and that was one of the reasons he supported LeRoy Collins when Collins was running for a seat in the U. S. Senate. (Unfortunately, a real political animal defeated Collins so overwhelmingly as to be heartbreaking.) John calls himself a pragmatist. He believes that "Government should protect men from one another and from the other organizations, devices, violences that man keeps creating. Government is always cyclical -- going from revolutionary to power-progress, to status-quo, to oppressive, to decline and death. All power corrupts; all committee effort is asinine, 99 of 100 politicians are warped, limited, saddening simpletons. Most of mankind is indifferent to political philosophy." John believes in a divine, inexplicable order (i.e., shape, texture, rhythm) to the observable universe, from single leaf to island universe, but feels that joining in groups to celebrate such condition is grotesque, often ludicrous, sometimes cruel. Personal awe needs no congregation. We asked John about his current and future writing plans. His answer: "In order: A McGee, The Blood Game (a novel he started some time ago but put aside until now), another McGee, The Primitive Experience (the second Coppolino trial), and that takes me so far into 1970 that I will not make any guesses as to what, God willing, comes after that." When asked if there would be more than twelve McGee novels, he replied that it would depend on how he felt about it after the twelfth... He may not sit around and wait for "inspiration", but like all good writers he writes first of all for himself. So, if there are to be more than twelve McGee novels, we must hope that John's interest in Travis continues, and that he will not tire of McGee as Doyle did of Holmes. John's mother is still living in Utica, N. Y. His sister Doris and her husband, a construction company executive, also live in Utica. John D. and Dorothy MacDonald are "pretty much turned off and turned on by exactly the same things." John says that neither of them "are what anyone would call gregarious. We are sufficient unto ourselves, and stick with the very few good, close and true friends, cherish privacy, and find all the days far too short for all of the things we want to do."